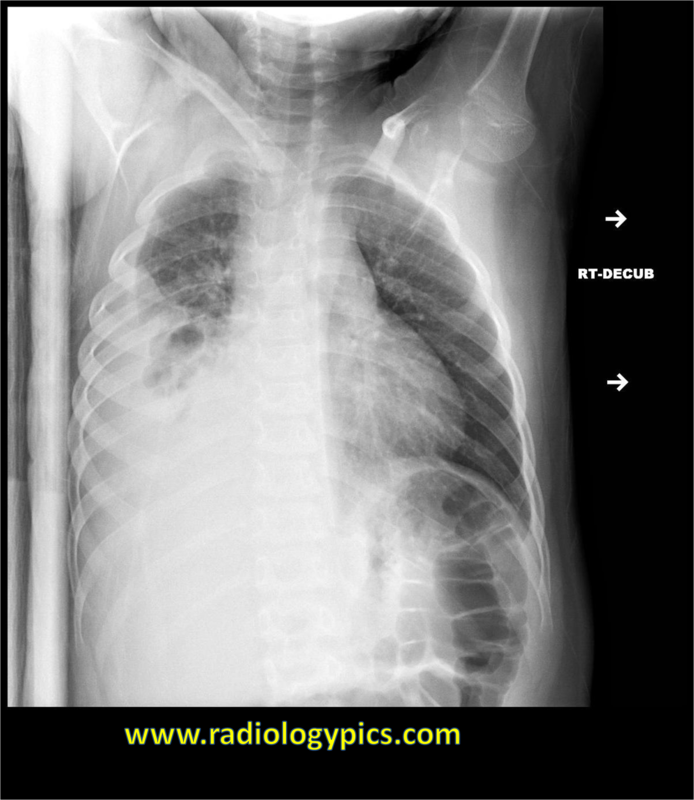 Empyema (loculated pleural effusion): right lateral decubitus radiograph shows a right sided pleural effusion which does not flow freely to the dependent portions of the chest indicating it is a loculated pleural effusion, or empyema. This is the appearance of an empyema on a lateral decubitus chest radiograph. Pleural effusions are classified as either transudative (simple fluid) or exudative (complex fluid containing pus, blood, or protein). On ultrasound, transudative pleural effusions are anechoic and simple appearing, whereas exudative pleural effusions are complex appearing with echogenic debris and septations or loculations. To distinguish radiographically whether a pleural effusion is loculated or not, a lateral decubitus chest radiograph is required. It is important to place the side of the effusion down. For example, in the image above, the pleural effusion is on the right side; therefore, a right lateral decubitus film was obtained. In this manner, simple fluid should layer to the most dependent portion of the chest. When it does not, this indicates there may be some septations or loculations confining the fluid and the diagnosis is an empyema. This is the opposite technique to further evaluate the possibility of pneumothorax, in which the side of the suspected pneumothorax is placed opposite to the decubitus side such that air raises to the non-dependent portion of the hemithorax. See a nice case of bronchopleural fistula here, which can result in chronic hydropneumothorax and empyema or can also be caused by an empyema.